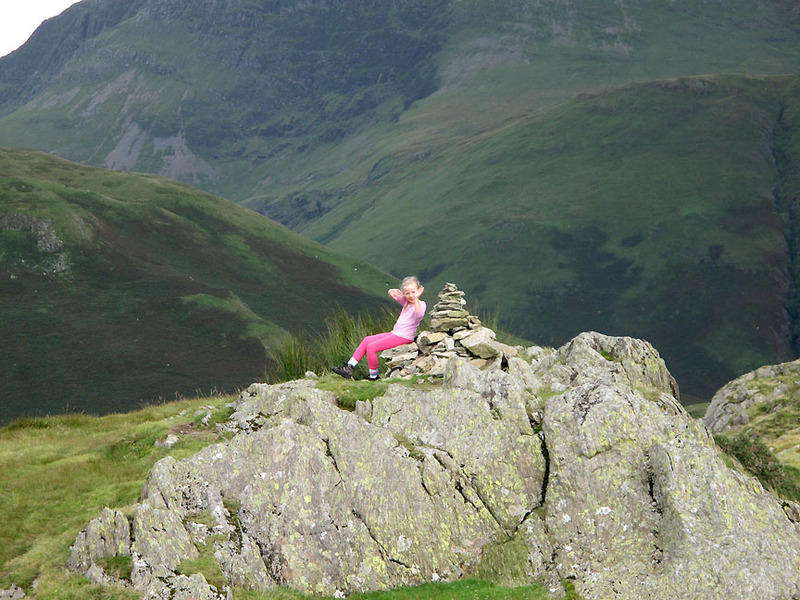 " Rannerdale Knotts with Abi "
Date & start time: Tuesday 21st August 2012, am start. 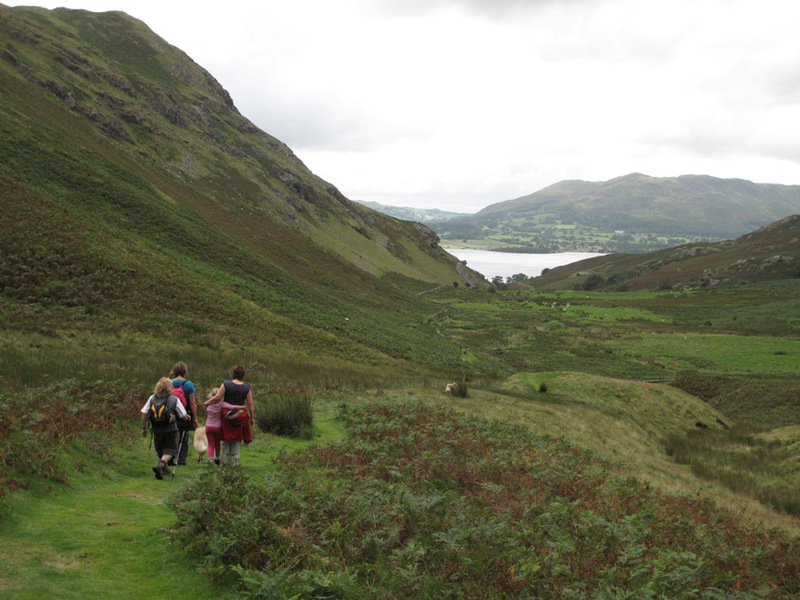 Places visited : Rannerdale Knotts, Low Bank and back down the valley. 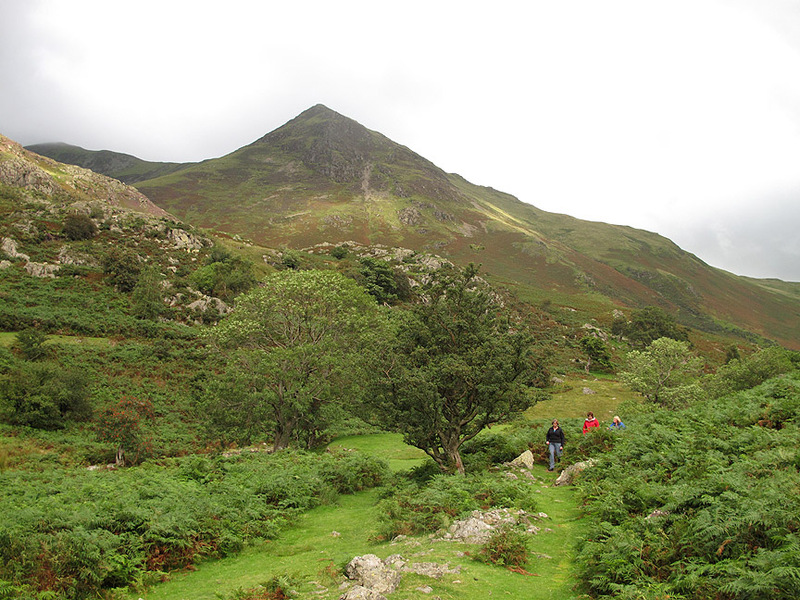 Walk details : 2.85 mls, 930 ft of ascent, 2.5 hours. 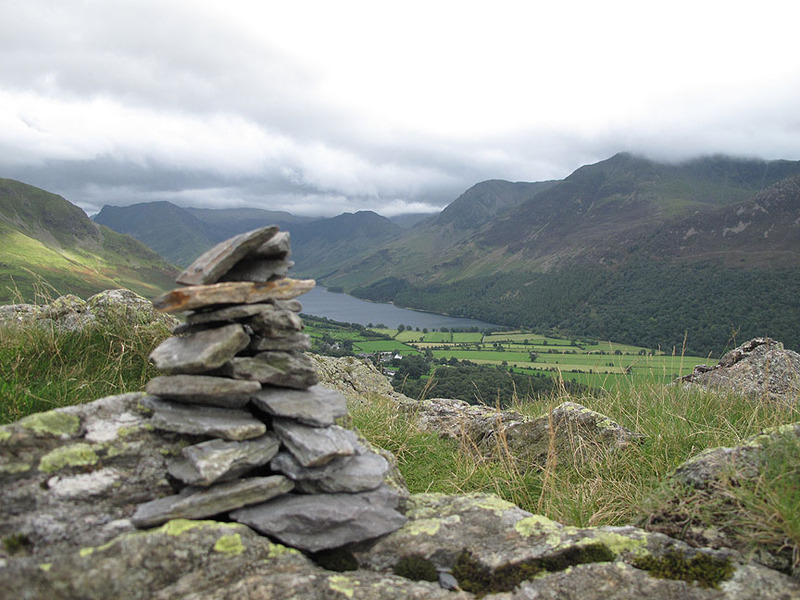 Highest point : Rannerdale Knotts, 1,160ft - 355m. 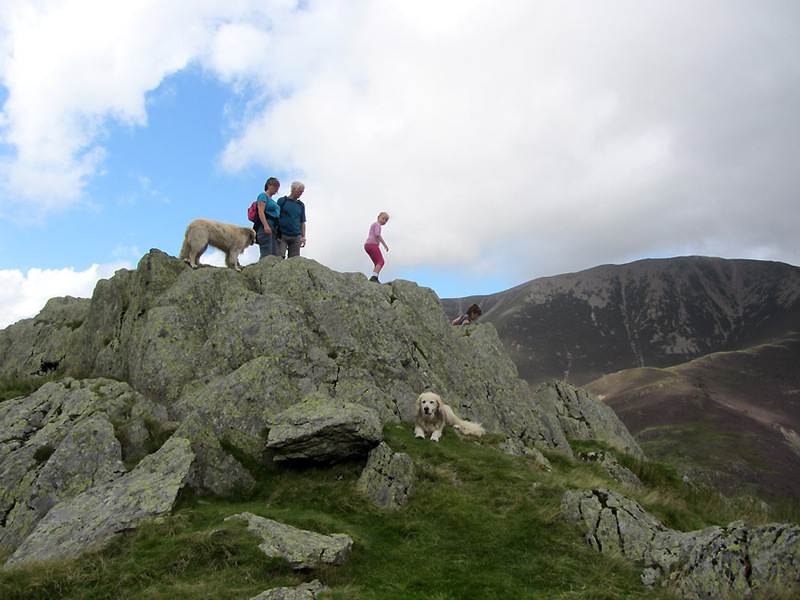 Walked with : Sue, Paula, Abi, Ann and the dogs, Harry and Bethan. Weather : Sunshine and summer clouds but a light rain shower to end. 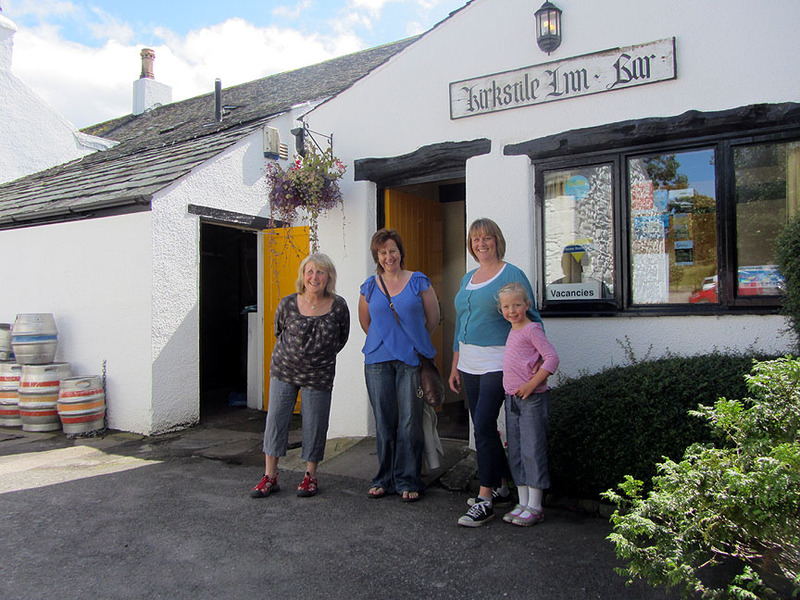 before we adjourn to the Kirkstile for lunch. 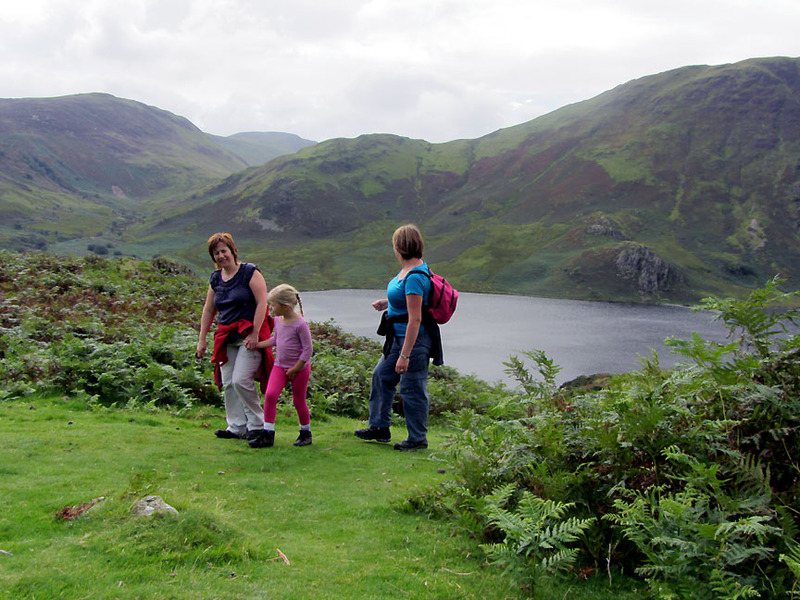 After a relaxing meal we took Paula, Sue and Abi to collect another Wainwright point on a familiar landmark in the valley. 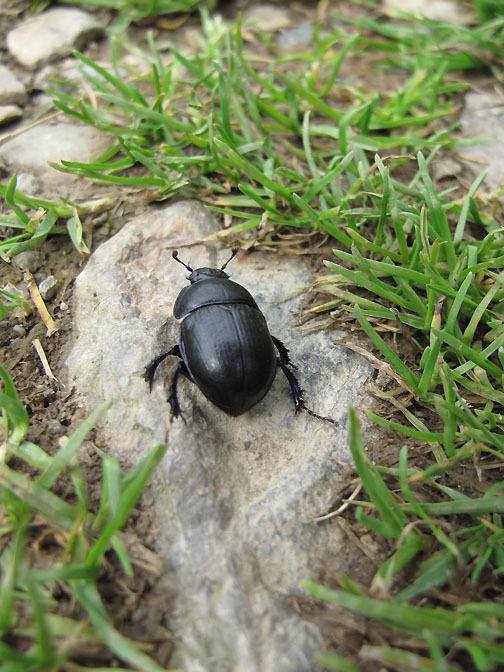 To start though there is an important job to do in the garden each day. 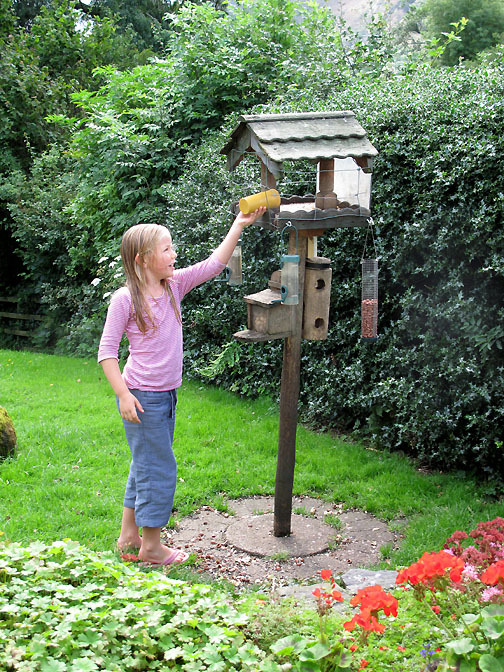 Hold your cursor over the picture to help Abi feed the birds. and the entertainment value is worth every penny. Did I mention lunch ? For those of a hungry disposition . . . look away now ! 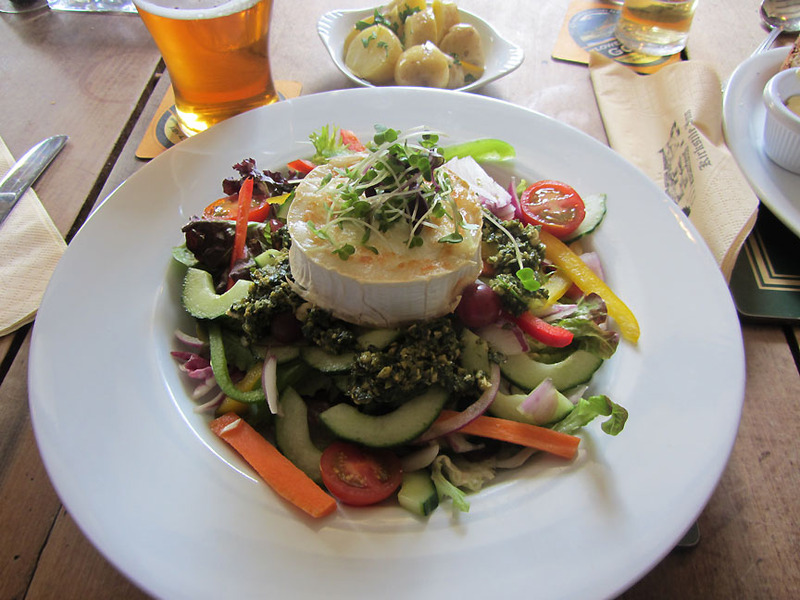 A Kirkstile Salad with pesto and a grilled goats cheese topping. Can't stay in the pub all day . . . time to get out for a walk. After yesterday's low cloud, today's sunshine makes a welcome change. The beach at Hause Point is the starting point for the walk. The dogs enjoy a game of throw the stick . . . but unfortunately there weren't too many around to throw. 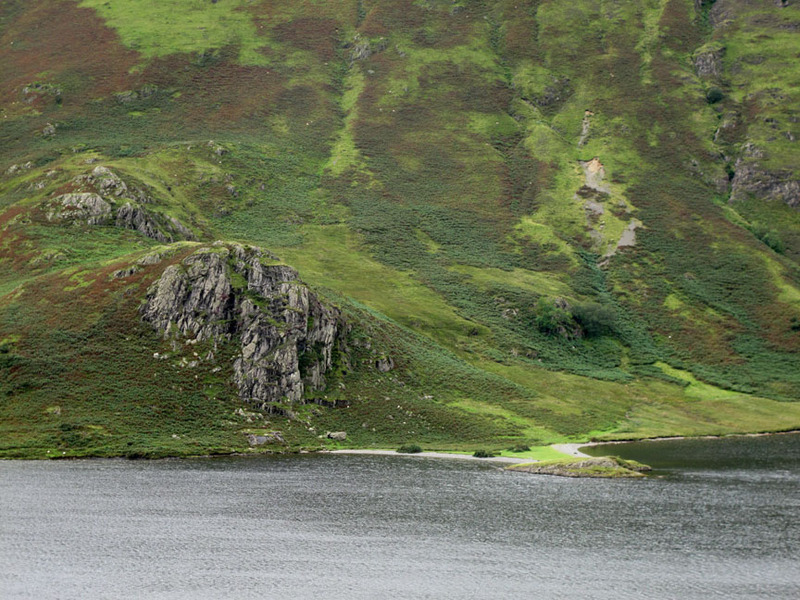 High Ling and Low Ling Crags across the water from Rannerdale Knotts. 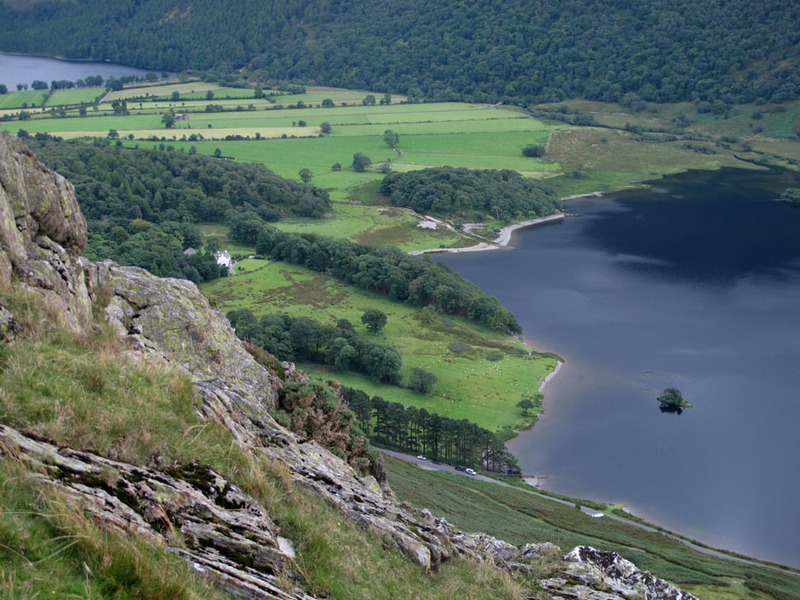 They share the same geology as the Knotts and line up exactly on the opposite side of Crummock Water. Mother and Daughter . 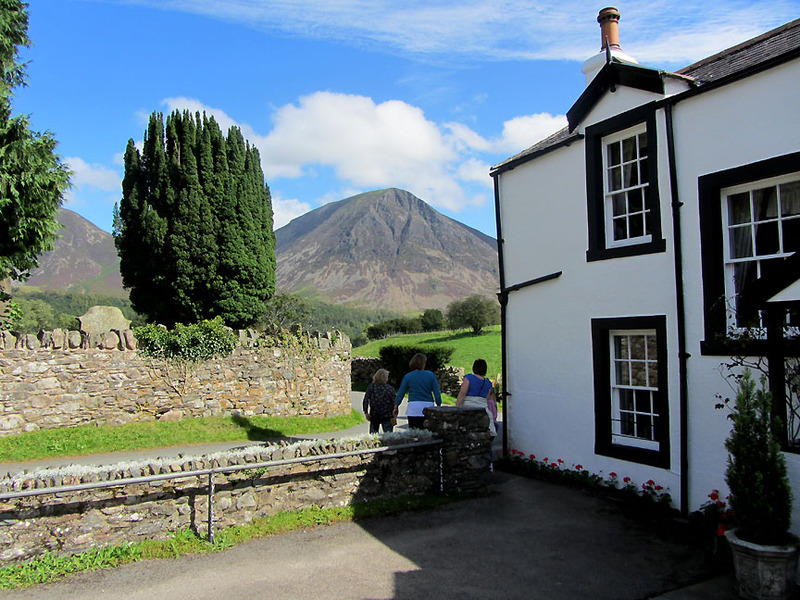 . . with the High Stile Ridge behind. Friend, daughter and Mother with Mellbreak behind ! Creatures great . . .
. . . and small. 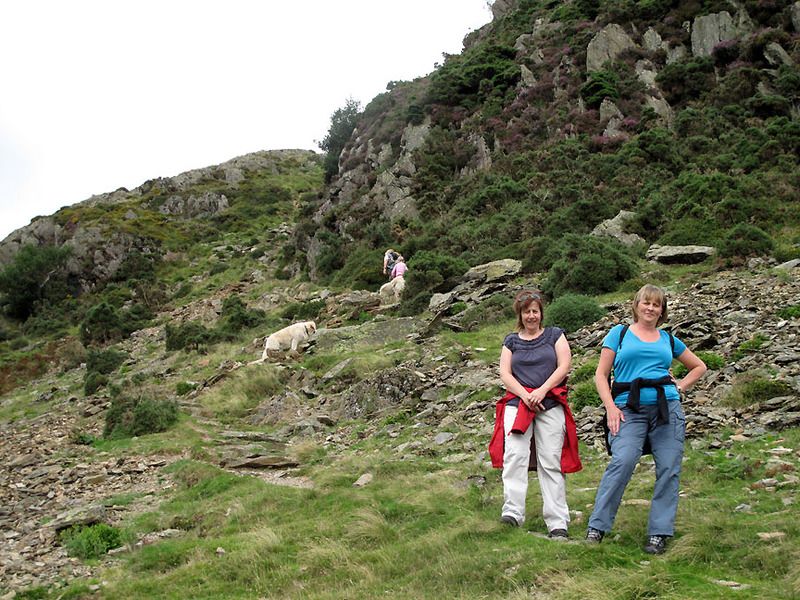 Ann and Abi strike up the pitched path while Sue and Paula stop for my photo. The path from here up must be one of the steepest pitched paths in the area. 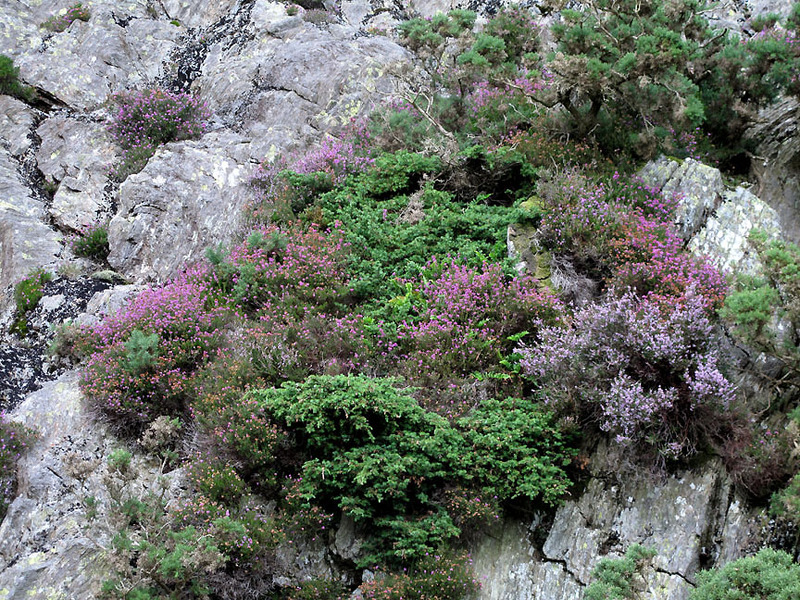 A ledge of heather and dwarf juniper I believe. 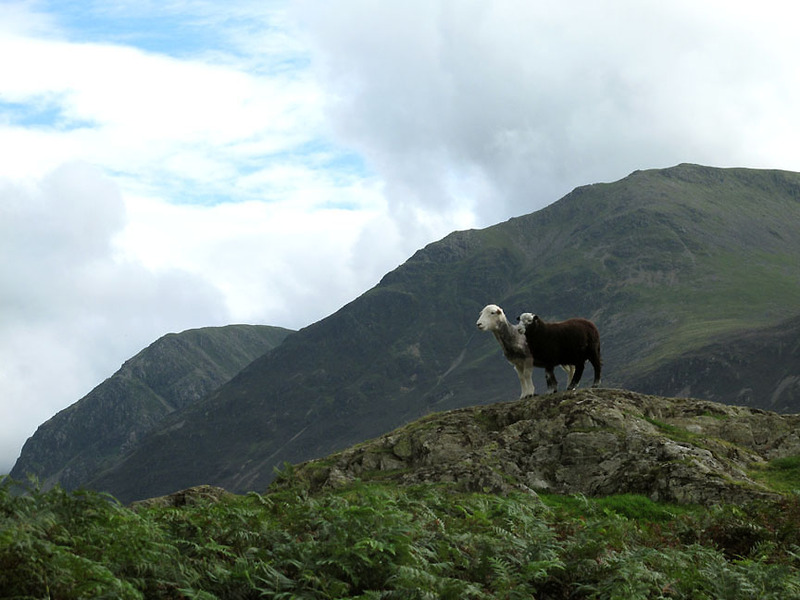 The fell behind is Grasmoor with its slightly pink scree slopes. The heather is starting to bloom nicely. We could do with some more sun to really bring out the colour. 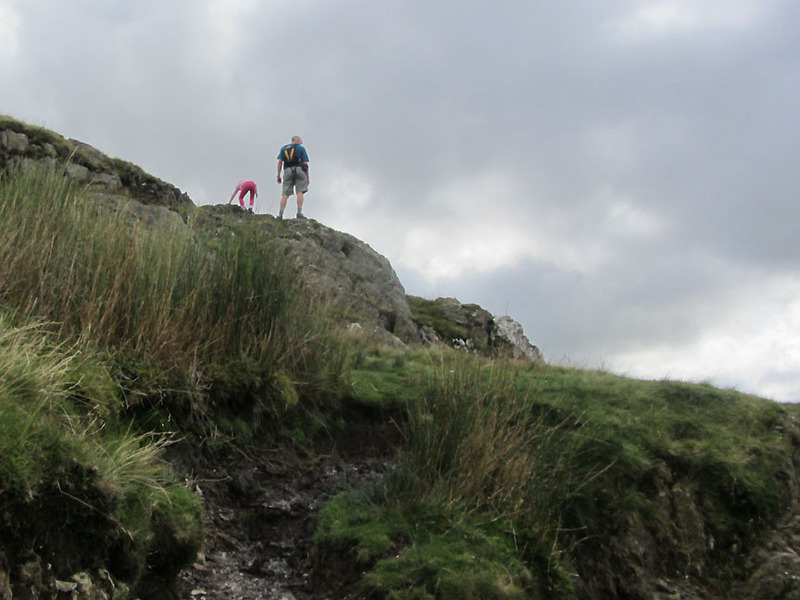 Bethan is up ahead enjoying a little rock scrambling. 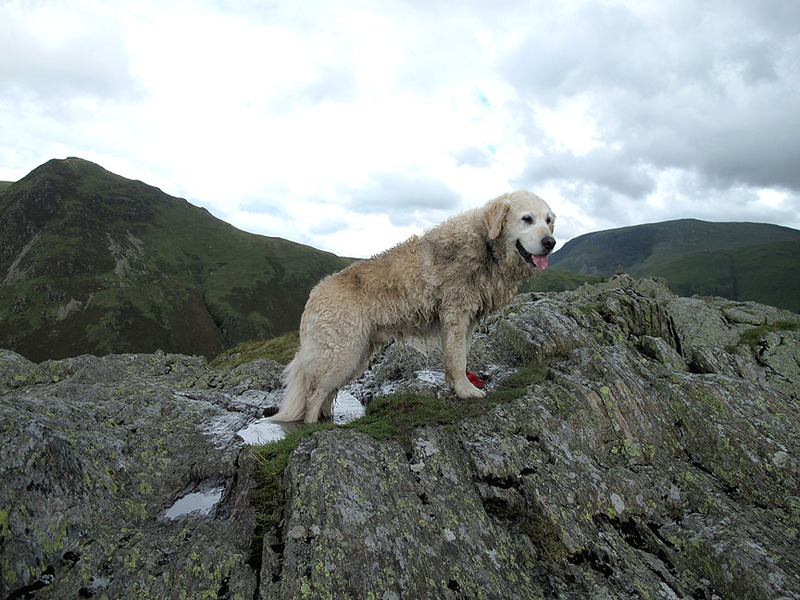 Abi too wanted to take to the rock rather than wallow in the mud of the footpath.
" Hi Mum . . . I'm up here ! " Hold your cursor over the picture to encourage Abi to wave.
" Great these summit pools on hot and humid days." The monster from the deep emerges dripping with water. 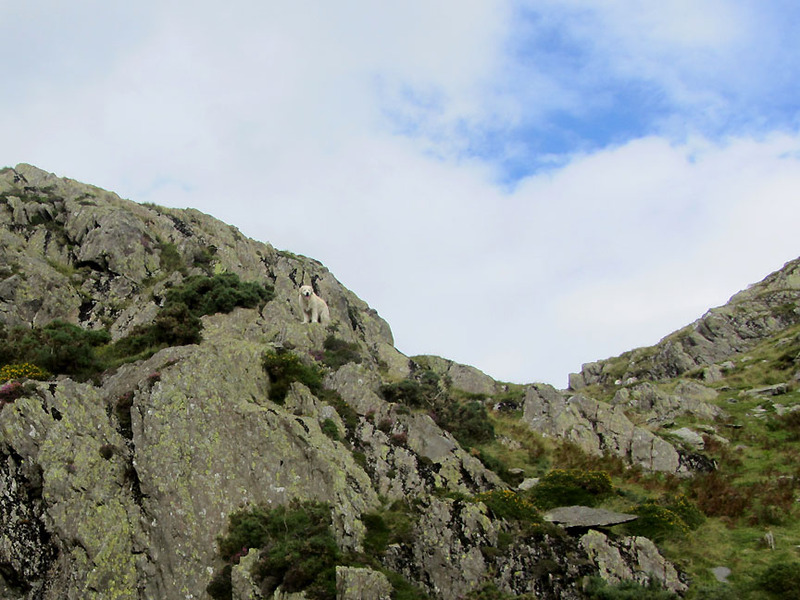 Keeping well out of the way of a shaking dog, Abi is already over there on the main summit. The weather is nice but I don't think it is going to last. 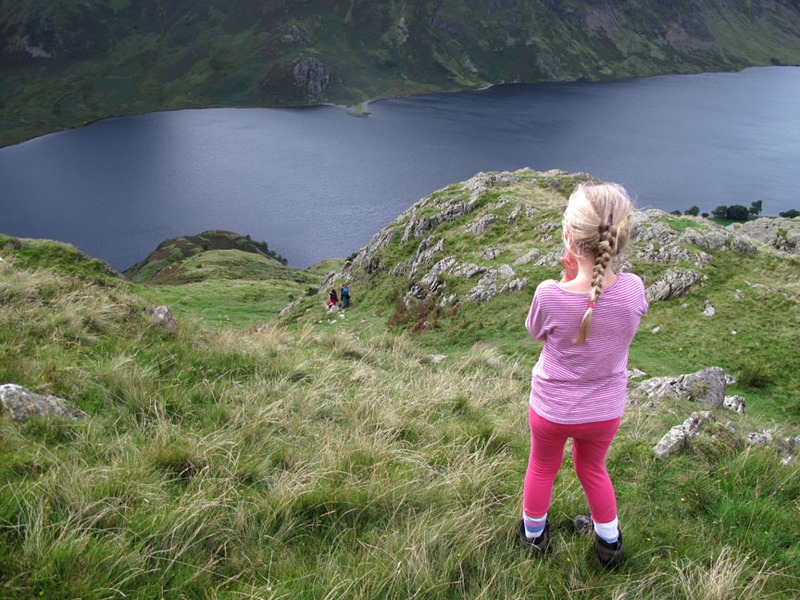 Here we are looking down on Wood House at the head of Crummock Water. 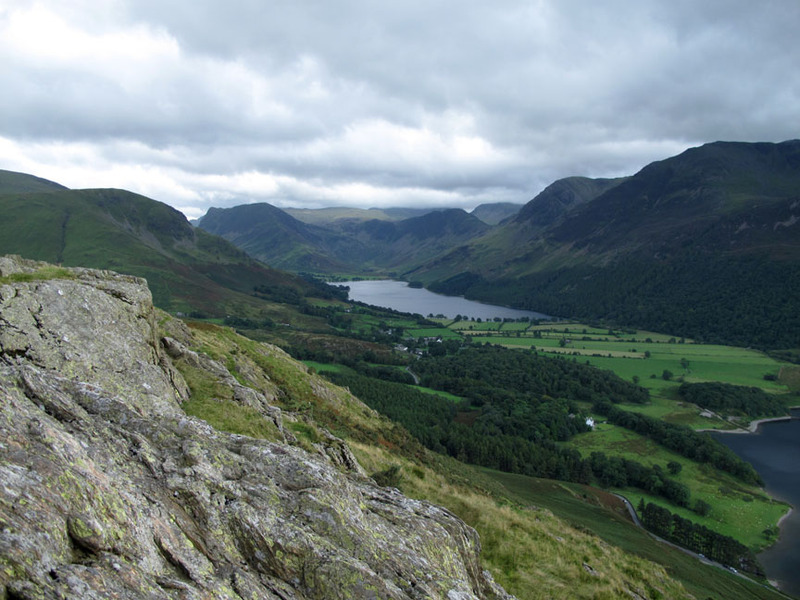 and Great Gable, where the girls were yesterday, is once again starting to be covered by cloud. 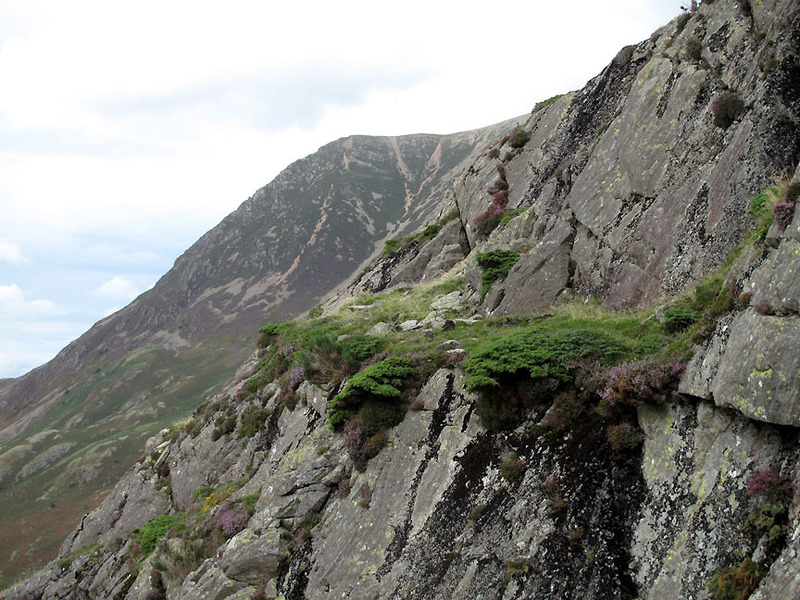 but it is in fact the third Rannerdale Knott (rock outcrop) along the ridge. The view from the mega-cairn on this summit . . . note the cloud is creeping a little lower onto the fells. 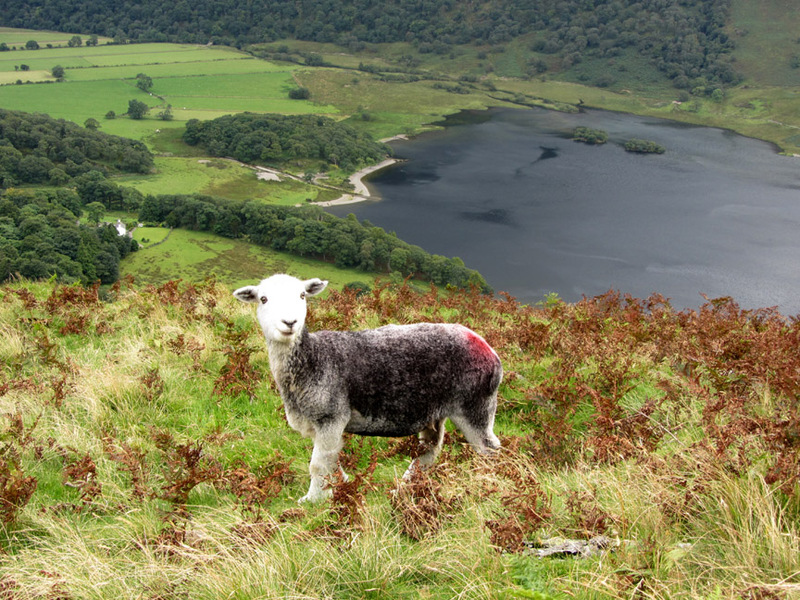 as as we walk along the ridge towards Buttermere. 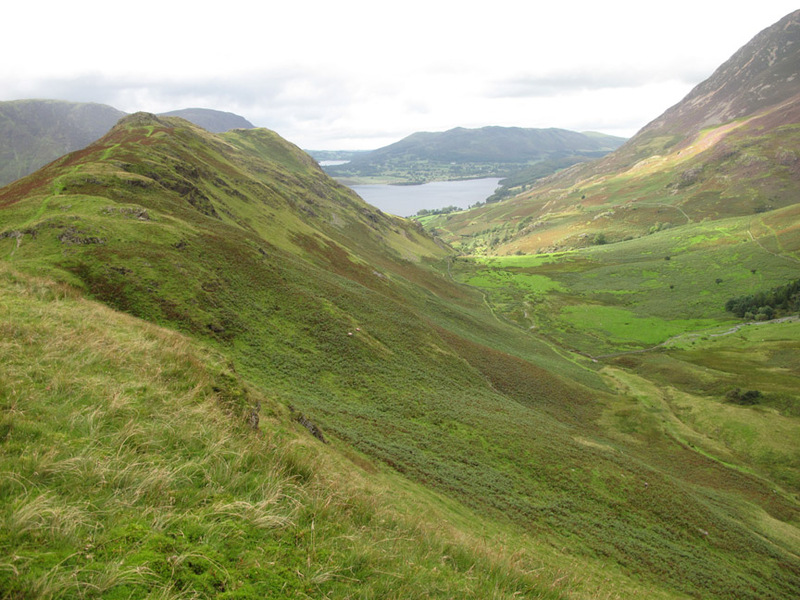 Looking back at Low Bank and the sunshine that is still present on the northern flanks of the fells. 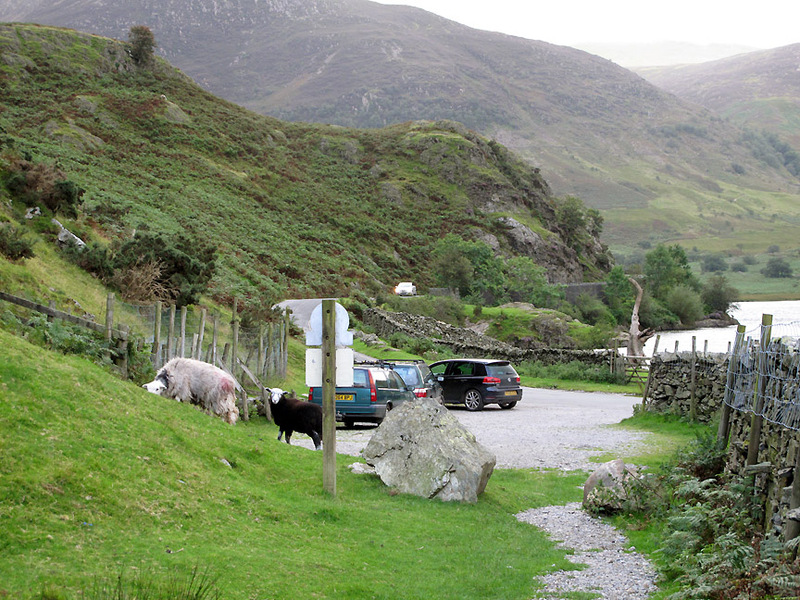 and we start our steady descent down Rannerdale Valley. 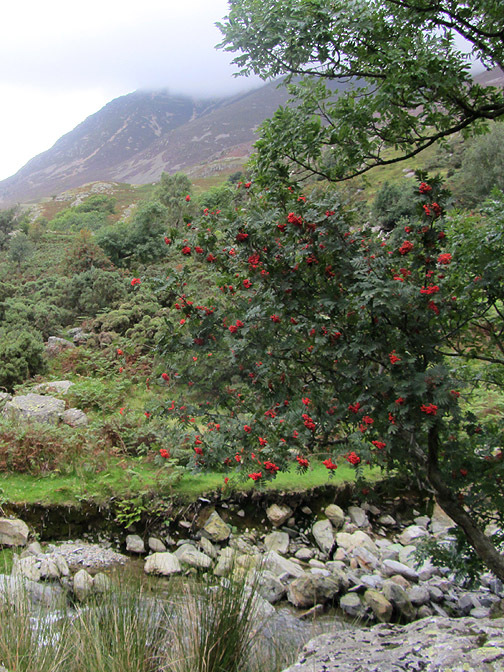 It is a good year for bright red Rowan berries . 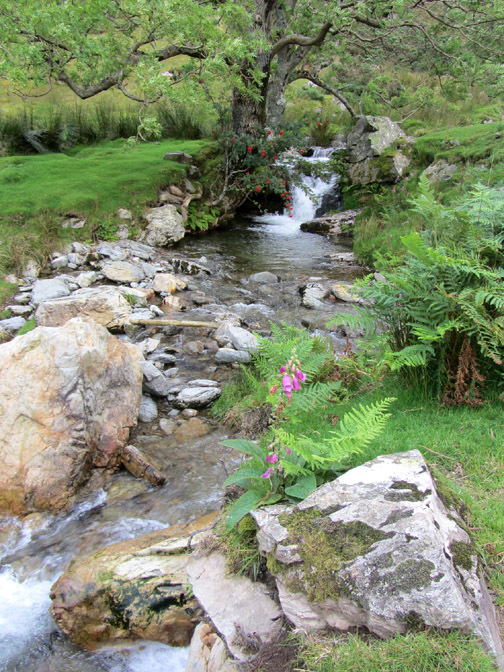 . . these are growing alongside Squat beck. 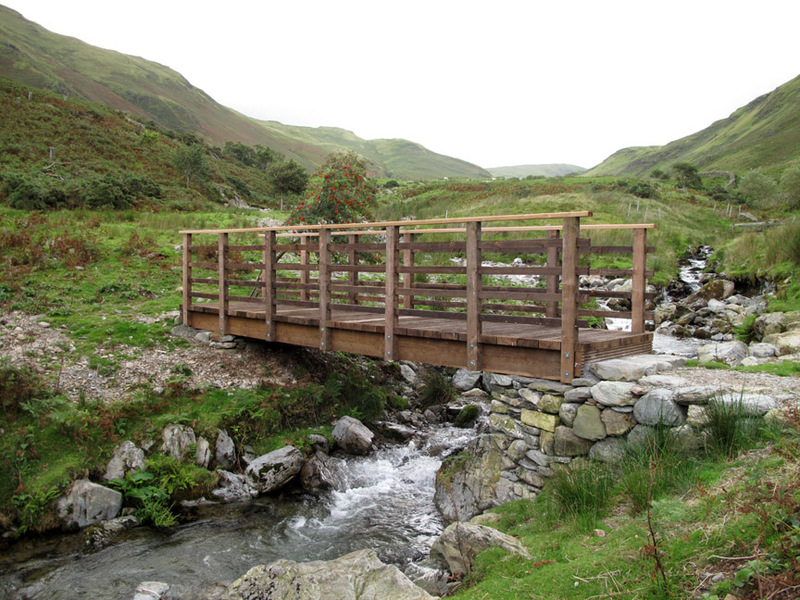 There's a new bridge at the top of the bluebell area to replace the one dislodged by the floods of 2009. 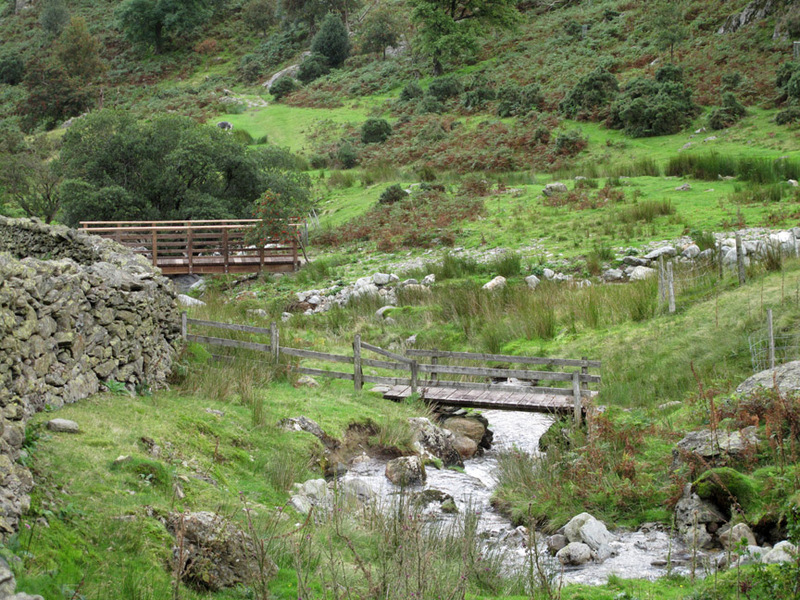 The small bridge in the foreground is on Squat Beck and didn't suffer the same fate as its larger neighbour. and the path diverted to match up with this new bridge location. 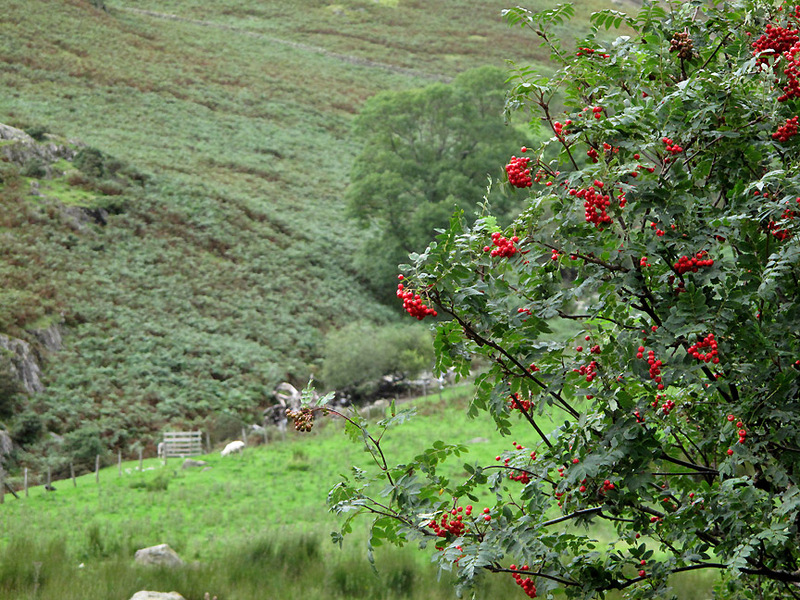 These Rowans were seen further down river . . .
. . . where the stream emerges onto more open ground. 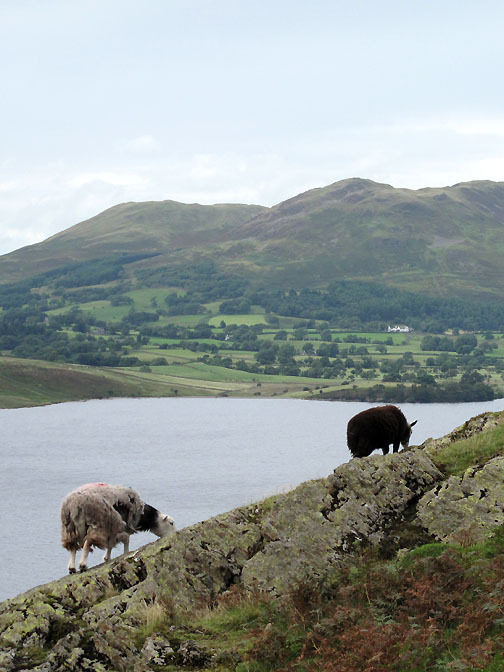 The dramatic, triangular profile of Whiteless Pike as seen from the Rannerdale Valley. 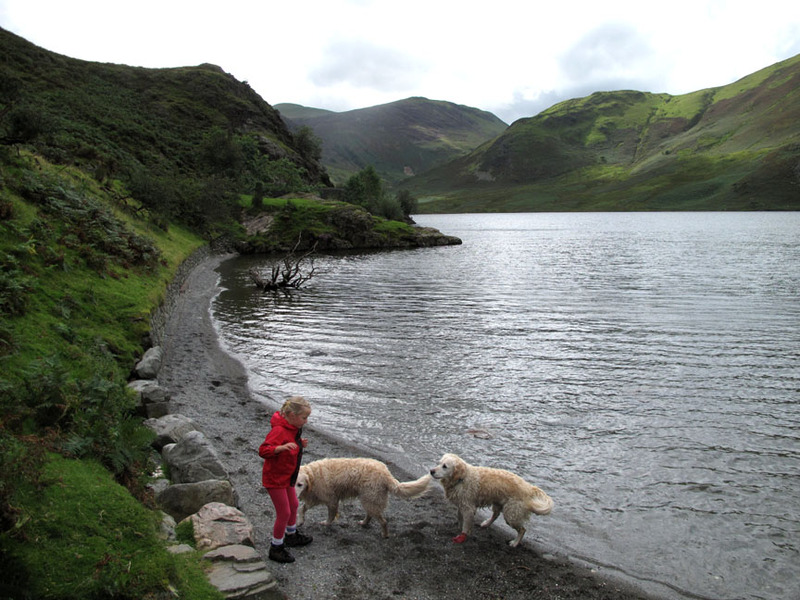 (and a swim for the dogs because they got so dirty on the walk) but the weather had other ideas and it started to rain. We passed on a swim at Hause Point, keeping the dogs and therefore the inside of the car dry. They ended up being soaped and hosed down in the garden when we got home. I don't know what they rolled in but they certainly smelt a lot nicer after an encounter with the doggy shampoo bottle ! This site best viewed with . . . a fine lunch and no washing up to do !